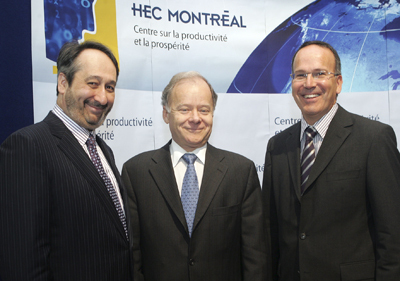 HEC Montréal opened its Centre for Productivity and Prosperity today, at a ceremony attended by Raymond Bachand, Quebec Minister of Finance, and many guests. In its budget in March, the Quebec government earmarked a $6 million envelope over four years to be invested in research into business productivity. The new Centre has a twofold mission. First of all, it will be conducting research into the productivity of companies in Quebec and the rest of Canada, and the determinants of our economy’s prosperity. Its second mission is to transfer knowledge on productivity, competitiveness and prosperity issues and make it more accessible, so as to contribute to public debates on these questions and serve Quebec society. In addition to the government contribution, the Centre is receiving $180,000 in financial support from Bell, over three years, to conduct research projects studying the links between productivity and information technologies, and $125,000 to launch the “Bell – HEC Montréal Challenge on productivity and information technologies.” Details of the Challenge will be announced at a later date. To mark the Centre’s opening, Director Robert Gagné released a first study, entitled Productivity and Prosperity in Quebec – 1981 - 2008 Overview. In addition, there are about a dozen projects currently underway at the Centre, in three main areas: human capital, corporate behaviour and public policy. The expertise of researchers at HEC Montréal and other organizations will be devoted to making this new Centre a key reference on the subject of productivity and prosperity in Quebec. Robert Gagné is a Professor with HEC Montréal’s Institute of Applied Economics. He holds a Ph. D. in Economics from the Université de Montréal and was Co-Chair of the Council of the Federation Advisory Panel on Fiscal Imbalance in 2005-2006 and was Chair of the Task Force on Tax Assistance for the Resource Regions and the New Economy in 2007-2008. Fellow of the Centre for Interuniversity Research and Analysis on Organizations (CIRANO) and regular member of CIRPÉE, Robert Gagné’s main fields of interest are applied econometrics, industrial organization and public policies.